Our goal is to cater to you and only you. We take our time with each and every customer. We only use the best products on all our customers some of the products are OPI, Zoya, and Chine Glaze. We are here to make you look and feel fabulous. 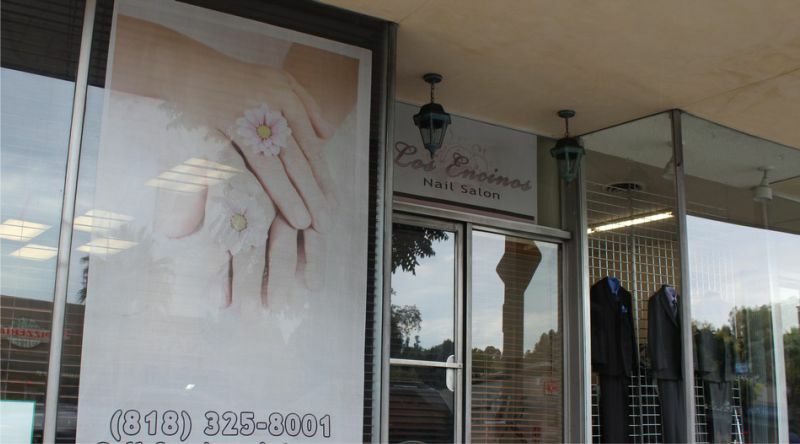 Los Encinos Nail Salon has been well known among locals in Encino since opening in 2009. Our experienced manicurists have over 20 years of experience they know the latest techniques like SHELLAC and OPI’s soak off gel. All of our clients receive top-notch service. Our nail spa is whirlpool-free – instead we use modern pedicure bowls that are a more hygienic alternative to noisy thrones or jets. As a certified Shellac salon, we ensure our clients maintain healthier nails and lasting results. Our facialist has had 23yrs of experience and is continuously educated and trained on technique. We also offer waxing in our salon. Located on the famous Ventura Boulevard in Encino filled with shops and restaurants you can make a day of relaxing and dinning or just come relax after a long day of work. I am the owner of Los Encinos Nail Salon. I adore my clients and absolutely love what I do. Three and a half years ago, I had the opportunity to combine my ambitions of being independent and owning my own business with my love of making my clients’ hands and feet beautiful… and viola…Los Encinos Salon was born. I still cannot believe it sometimes. I feel very blessed and thankful to that happens to me. I have been doing nails for 11 years and specialize in manicures and spa pedicures. I am exceptional at what I do and can make even the most neglected hands and feet look amazing. Book an appointment with me and you will not be sorry. Donna has been a professional licensed manicurist for 35 years. She gives a wonderful, relaxing spa pedicure, and manicure. She has researched and been trained in the gel service of SHELLAC. She loves to beautify your nails with top quality products and delightful conversation. Janet has been doing nails for 32 years and is a true “people person.” Her favorite part of her job is her clients. Janet loves meeting new people and that is why when you meet her once, it will feel like you have known her forever. She is warm, friendly and does amazing nails and pedicures. Debbie has been a nail technician for 24 years and counting. She is always enjoyed the glamour of the beauty industry and it shows. She does meticulous nails and takes great pride in her work. Debbie’s “old school” industry standards are evident as she takes time and care with every service performed. She uses only the highest quality products on her clients and will never compromise. Lisa has been beautifying skin for 21 years. Her magnificent treatment style is from Europe and consists of deep pore cleansing, nourishing plant-enzyme masks and replenishing Vitamin A treatments that even out the skin’s texture. Lisa also specializes in the treatment of acne for teens and adults. The results have been life-changing for her clients who suffered from this terrible condition. Lisa loves her work and enjoys helping people get the radiant skin they desire. Gail has been in the beauty industry for 28 years and specializes in body waxing. She has a way of gently working with her clients in order to give them the look they want. To book an appointment or contact us please call 818-325-8001.